Farewell, Windows Vista, we hardly knew ye. But as of now* you're out of support and even-more-unloved than was previously the case. Vista appeared in January 2007 and quickly irked users with a feature called “User Account Control” that produced constant queries about whether they wanted to do something. Microsoft added that annoyance because Windows XP suffered all manner of security woes. Vista made a lot of security improvements under the hood, but also put security in users' faces by constantly reminding them that their actions had consequences. Learning how to turn off UAC became an important step in any Vista implementation. Vista was also slow: it's vaunted “Aero” interface made it slower than Windows XP, which is not what an upgrade is supposed to do. It later emerged that Microsoft may have known that Aero was a resource hog, as it found itself in a fight with Intel over a plan to label some low-specced PCs “Vista capable” even though they may have struggled to run the OS. It didn't help that a Service Pack planned to fix things up emerged months later than planned, leading then-Microsoft-CEO Steve Ballmer to say the OS was “a work in progress” rather than the finished item. That he said that 13 months after launch indicates the heat Microsoft was getting at the time over the OS' non-performance. StatCounter offers data on OS usage since 2009, as measured by prevalence of OS detected during web browsing sessions. As its graph below shows, Vista's light green line never topped Windows XP's market share was quickly overtaken by its successor Windows 7. 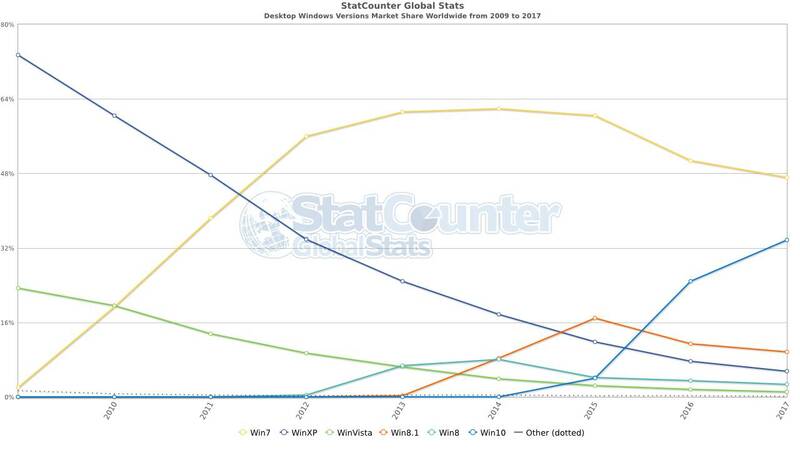 Desktop Windows Versions Market Share Worldwide, 2009 to 2017. Source: StatCounter. Click here to embiggen. As the chart shows, Vista's bumped along the bottom with about one per cent market share for years now. Which may be why Microsoft hasn't even offered the extended paid support offering it developed for Windows XP, to sneak out secret fixes to those willing to write substantial cheques. * At the time of publication there were a few hours left of April 11 in Hawaii and some other Pacific islands. Good luck getting support out there, folks.